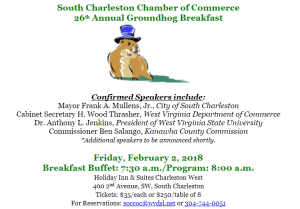 The 26th Annual Groundhog Breakfast & Economic Forecast Presented by Komax Business Systems is scheduled for February 2, 2018 beginning at 7:30 a.m. at the Holiday Inn & Suites in South Charleston, WV. Tickets are $35/each or $250/table of 8. For Reservations email soccoc@wvdsl.net or call 304-744-0051.